Johnny Iuzzini feels Amanda Faber is pulling out all the stops for her "Custard and Meringue Week" showstopper bake. Amanda means business with her Coconut Lychee Pavlovas topped with lychee syrup and champagne caviar. For the champagne caviar she figures there are bubbles in champagne so why not make bubbles out of champagne to top her pavlovas. Watch the full episode of "Custard and Meringue Week" from Season 2 Episode 6 of The Great American Baking Show. 1. Pre-heat the oven to 225° F.
2. Trace circles on the back of parchment paper using a pen and circle cutter. 3. In the bowl of a stand mixer fitted with a whisk attachment, combine the egg whites and salt. Mix until soft peaks are formed. 4. Combine the cornstarch and processed sugar. 5. Then, tablespoon at a time, add in the sugar mixture to the egg mixture. Mix on high, scraping the bowl as needed. 6. Once glossy and smooth mix in the vinegar. 7. Fold in the seeds of the vanilla bean. 8. Fit a piping bag with large star tip with curved tines. 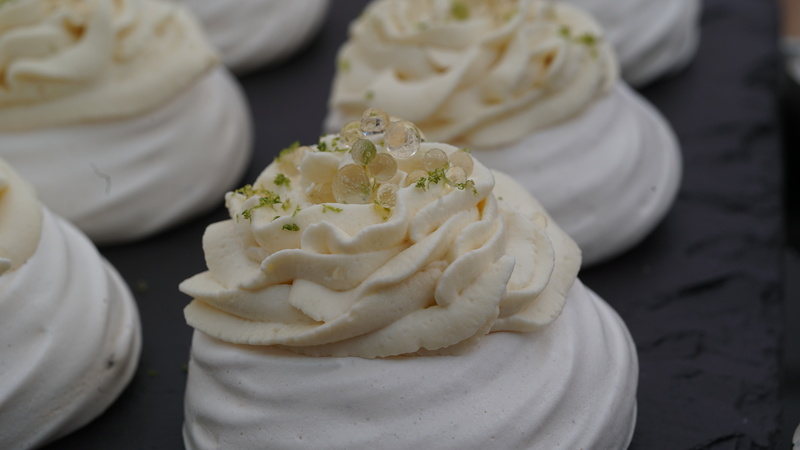 Pipe the meringues in a nest shape. 9. Bake for 1 hour and 15 minutes. Then turn off the oven and leave inside for 30 minutes. 10. Remove and cool completely on baking sheet. 1. Combine the lychee drink and lime zest in a heavy-bottomed sauce pan. 2. Bring to a boil and hold there for 5 minutes. 3. Combine the cornstarch and water in a small bowl. 4. Remove the lychee mixture from the heat. Stir in the cornstarch mixture. 5. Bring back to a boil and hold for one minute. 6. Pour in to a bowl and chill. 1. Combine the heavy whipping cream, Coco Lopez, confectioners sugar, and pure vanilla extract in the bowl of a stand mixer fitted with a whisk attachment. 1. Check that the oil is very cold. Move to the freezer for a few minutes if needed. 2. Combine the gelatine and cold water in a small bowl. 3. Heat the champagne in the microwave until warm-hot. Stir in the sugar until dissolved. 4. Combine all of the ingredients in a small pitcher or measuring cup with spout and stir until smooth. 5. Pour mixture in to a plastic squeeze bottle. Let cool for a few minutes. 6. Dribble the champagne mixture in to the oil to create tiny "caviar" spheres. 7. In batches, remove the caviar and place in a fine mesh sieve. Run cold water gently over and through to clean off the oil. Transfer to a plate lined with a paper bag to chill. 1. Fill the vanilla pavlovas with a dollop of whipped cream. Then spoon the lychee jelly and another dollop of coconut whipped cream on top. Garnish with lime zest and champagne caviar.